SMHL has the potential to play a major role in implementing the changes that the Crimson has proposed. SMHL sponsors significant mental health awareness events throughout the year. These include the fall semester Depression Screening in all the dining halls (more than five thousand screenings over four years), Mental Health Awareness Week in the spring, and the distribution of Lamont care packages during reading period. Recently, SMHL ran pilot freshman workshops, similar to those offered by DAPA and OSAPR, titled “Speak Up, We’re Listening." These sessions used short case studies based on actual student experiences to educate students about the professional and peer-led resources available to them on campus and the importance of reaching out to others in distress. Also, in a short time, the SMHL website HarvardSmiles.com, a community blog and portal for information on campus resources, has become one of the most frequently visited websites on campus. Substantial growth of student participation further indicates the importance of SMHL to the College community. In February 2008 six students joined SMHL, encouraged by the hard work of Malorie Snider ’09. Today, twenty-six students from all four classes and all the Houses are active in SMHL. The rapid expansion of SMHL allows the group to reach the entire student body and to focus efforts on multiple aspects of the promotion of emotional wellbeing on campus. For example, liaisons work tirelessly both to develop and publicize events geared toward the promulgation of knowledge and compassion in regards to mental health. Others strive to frequently update HarvardSmiles.com with valuable blog entries and resources in order to foster thought and conversation among peers in the community. However, to respond to the rapid development of SMHL and the growing interest in mental health issues in the community at large, the organization needs the support of other groups and institutions on campus. We hope that this information will inspire the entire community to support SMHL. We encourage students to join SMHL and reach out to the liaisons in the Houses and Yard. 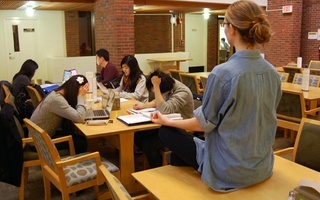 Visit HarvardSmiles.com to learn more about your student mental health liaisons. Together we can build a caring community, a hope that inspired the creation of SMHL. Paul J. Barreira is an Associate Professor of Psychiatry and the Director of Behavioral Health and Academic Counseling at Harvard University Health Services. Pilar A. Curtis ’11 is a psychology concentrator in Leverett House. 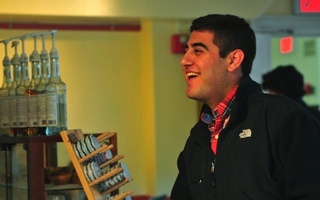 Seth A. Riddley ’12 is a History and Science concentrator in Mather House. They are Student Mental Health Liaisons. I had readings to do and papers to write, but they were to be done alone, and when I was alone I could let myself crumble. What If I Had Known? The misconception that reaching out in a time of crisis is indicative of personal weakness is gravely dangerous.